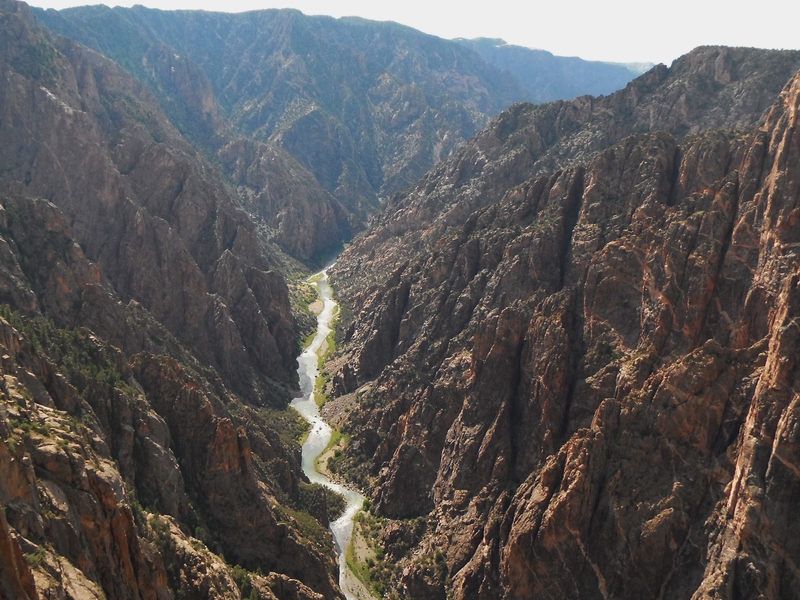 The impenetrable Black Canyon – that’s how the park film describes it. 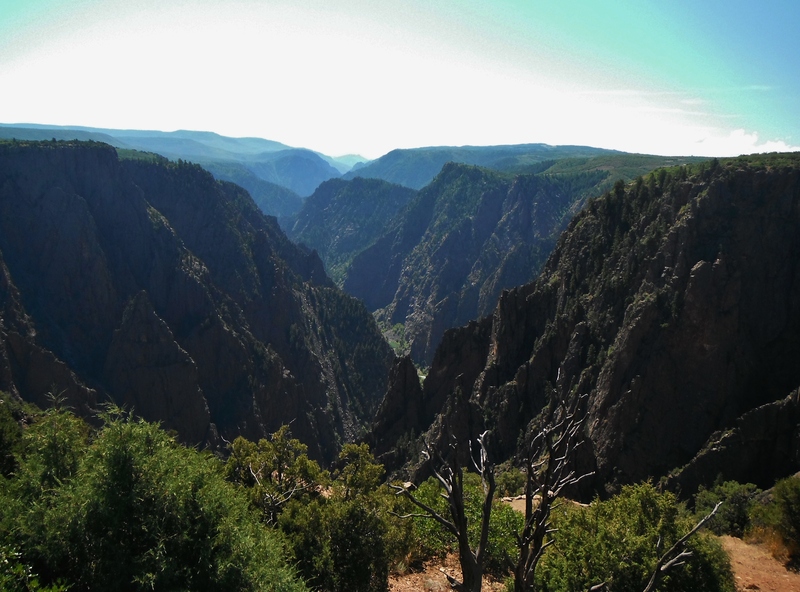 Carved by the Gunnison River into volcanic rock, this spectacular canyon must have come as somewhat of a surprise to the first peoples to stumble upon it. It certainly surprised me, as Austin and I drove past fairly unremarkable scrub covered hills and into the park. I didn’t say it out loud, but I must admit to thinking as we set up camp in the dark that first evening… hm, this otta be good. A mere three hour drive from Mesa Verde, I had been meaning to check out Black Canyon of the Gunnison National Park for some time. We awoke our first morning to a doe and her fawn foraging through the scrub in our delightfully private campsite. It was a Monday morning, and we didn’t mind at all that the deer were our only neighbors in the campground. After a quick breakfast we made our way to the visitor center, stopping along the road to catch our first glimpse of the canyon. It’s not often that you literally hear folks ‘oohing’ and ‘ahhing,’ but these human sounds abounded at this first overlook. It turns out I wasn’t the only one delighted by the sudden appearance of this enormous gouge in an otherwise rolling landscape. At the visitor center we received a map and newspaper, poked around the exhibits, watched the park film, and made a pleasant stroll down a wooden path to the edge of the sheer black canyon. From here we could see clearly the blue-green river 2,000 feet below us. We could hear it too, as the powerful flow that cut this masterpiece echoed off the rock walls to reach us at our perch thousands of feet above. “I want to be down there,” Austin said to me, as we stared down into the vertical abyss. I have to admit to having a similar thought. Already the day was a scorcher, and how cool would it have been to stick my toes into that sparkling colored water? But while my thought was merely a fantasy, I knew by the look in his eyes that Austin was serious. I knew there was a way. In my pre-trip excitement, I had thoroughly scoured the park website for information and had read all about the unmaintained routes that lead to the canyon floor. 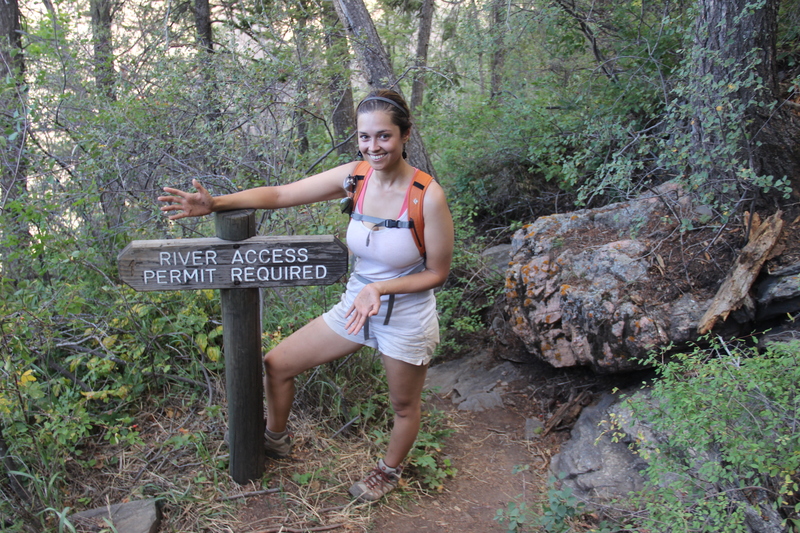 But you need to get a permit in order to do one and many hikers make it an overnight trip. Most of the routes are relatively short – the most popular descent is only two miles long – but it covers the entire 2,000 foot elevation change in half that distance. I hadn’t thought Austin, who hikes for a living in his job as a backcountry ranger at Rocky Mountain National Park, would be up for such a challenge on his day off. I imagined we would do a couple of easy hikes along the rim and return to our campsite to relax. But even if Austin had been struck by the unlikely and unarguable urge to climb the canyon, I comforted myself with the reassurance that we were simply not prepared. I had forgotten my camelback at home and Austin only had flip flops. Not to mention the only food we had on us were some leftover muffins from breakfast. No sensible ranger in his right mind would ever grant such fools as us a permit for a hike like this. Five minutes later we were permitted and ready to go. I felt unprepared, and I was nervous, I’m not going to lie. But it was an adventure that I settled into fairly quickly. I generally enjoy that Austin’s outdoor ambitions push me out of my comfort zone, and I attempted to calm my panic by imagining how fresh that water would feel between my toes once we made it to the bottom. I tried not to think about coming back up. 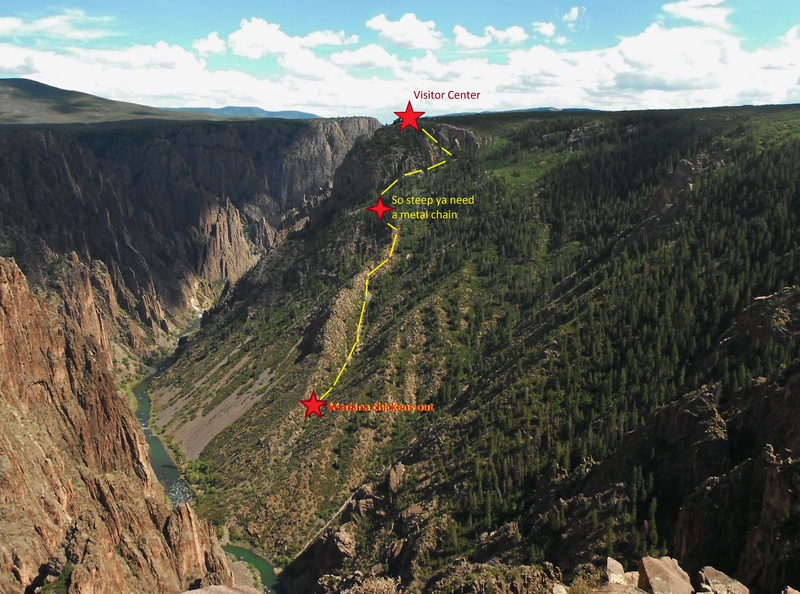 The route we opted for, called the Gunnison route, mostly follows a steep drainage the 2,000 feet to the canyon floor. 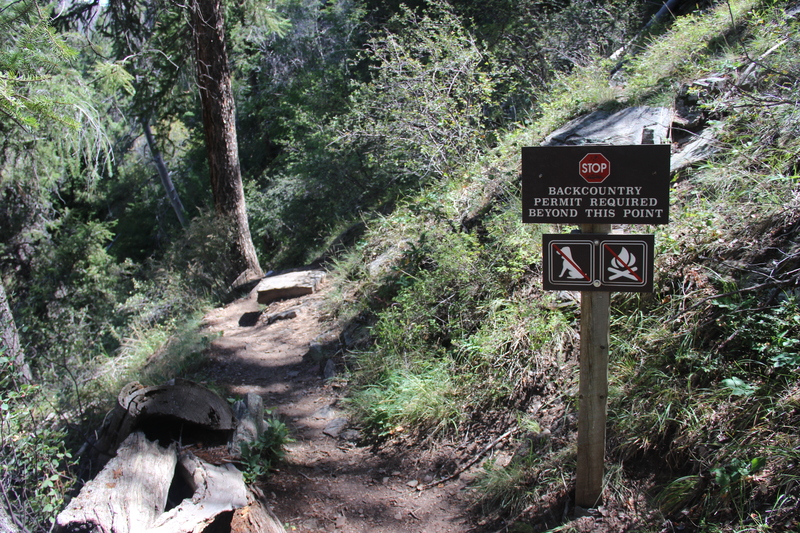 It left from a maintained path off the visitor center, before dropping off-trail into some precipitous forested switchbacks. At one point, the route is so steep a large metal chain has been installed to assist in the going. The ranger at the desk had shown us a series of pictures before we set off (as opposed to trails, routes are unmarked and unmaintained). He told us to expect to be about one third of the way down when we reached the chain. To be honest, Austin in his flip flops and I with my one bottle of water, never expected to make it that far. “We’ll just poke around,” Austin had promised me. So the sight of the chain appearing through the trees was a total joy! We had already come so much further than I had anticipated, and this motivated my shaky legs to grow strong. I am not a naturally sure-footed person, and without my beloved hiking poles (they sat at my house back at Mesa Verde, probably right next to my camelback) the downhill going was slow for me. 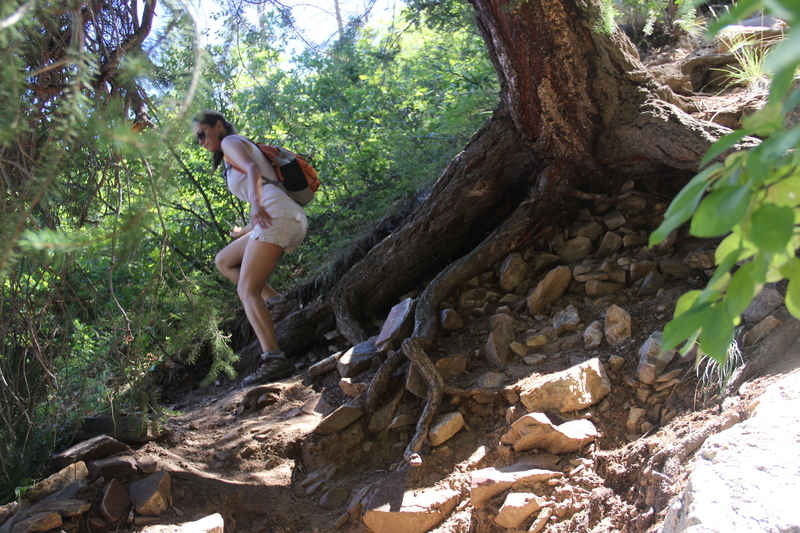 Austin bounced ahead with his camera while I picked my way and crab-walked down the steeper sections. 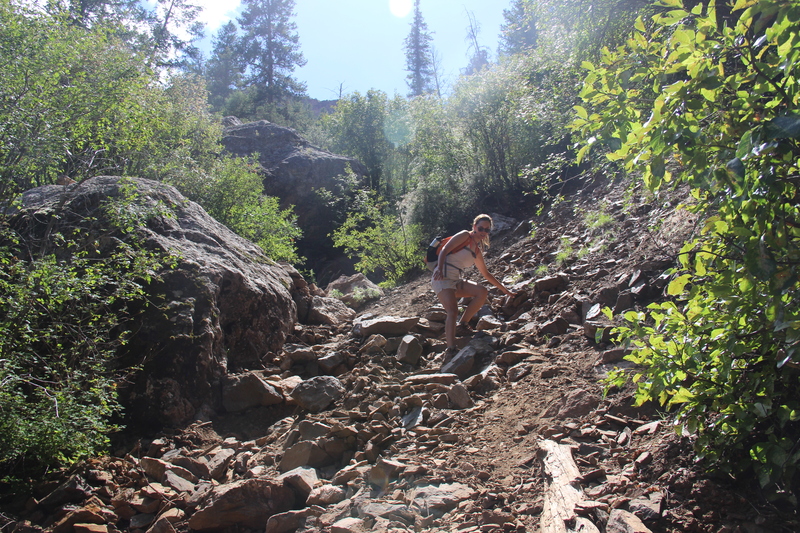 My hands were soon covered in pine sap and dirt, and the seat of my shorts was sorely stained – I’m a big believer on using my behind to slide out of steep situations. Luckily, not a single pair of pants have failed me yet! Eventually we came into the drainage, which was made up mostly of talus rock. The rocks slid precariously beneath my feet and I found myself making the most unattractive noises as I ungracefully stumbled down the slope, dislodging many a mini avalanche as I went. At one point, stopping to give my wobbly knees a much needed break, I startled at a movement in the brush right next to me. A neon green snake was falling through the branches, and I felt comforted by the knowledge that even the native creatures to this environment struggled with this cruel terrain. 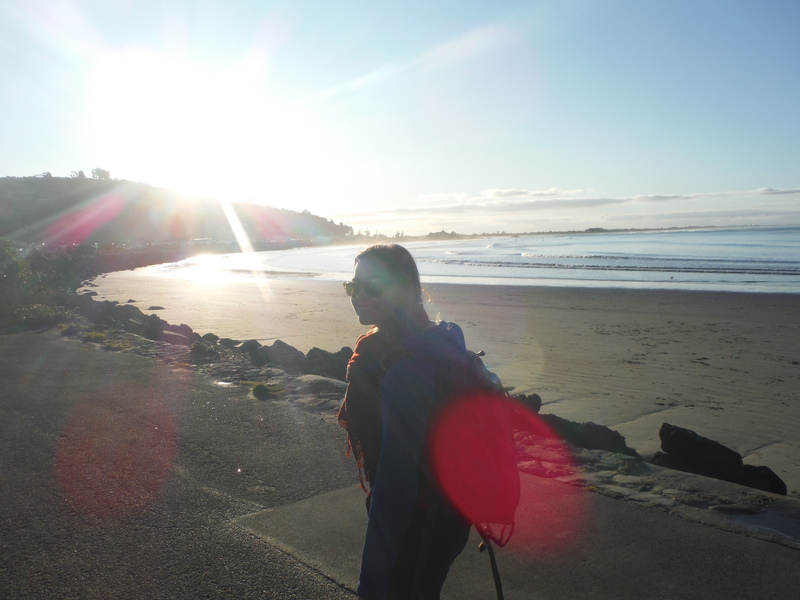 Eventually the talus turned into a fine, sparkling grey sand that did even less for my sense of balance. My breaking point came when I got to a point where I found I could not take a single step without the ground falling away beneath me, sending me sliding downslope each time. Austin was just ahead, and we could see the river and the bottom of the canyon. But I found myself suddenly reminded that with each challenging step down would be another up, and I sat down in the sand to contemplate what I was prepared for and how far I could stretch my comfort zone without putting myself in danger. Austin had been gracious in his insistence that we would turn around the second I felt I did not want to continue. I hate being his limiting factor, and by this point, just a few hundred feet from the bottom, I wanted to continue down too. But my water was running out, my legs were shaking, and the unstable ground was leaving my nerves unsettled. I wanted to cry as I admitted defeat, but Austin seemed joyous that we had made it as far as we had, and we turned around to ponder what seemed now to be an endless climb up. We had to use our hands and climb fast in order to beat the fine ground falling out from beneath us. 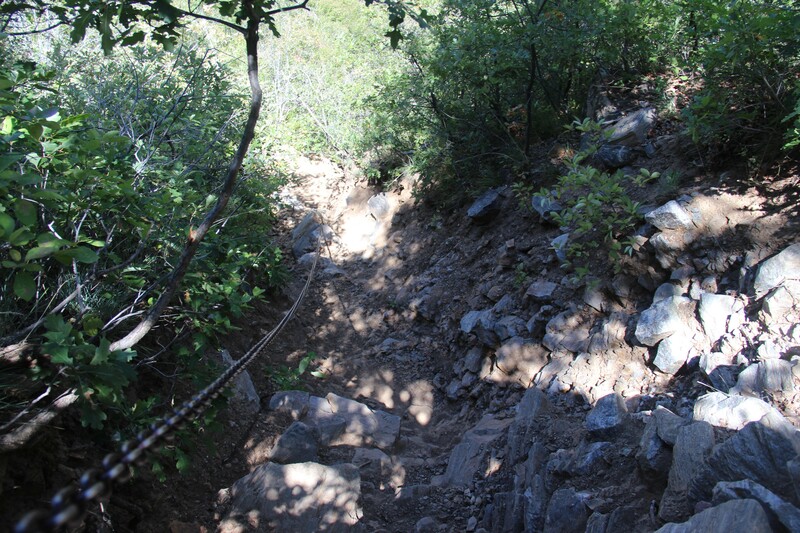 I climbed the talus as ungracefully as I had come down, continuing to dislodge rocks as Austin darted like a mountain goat around the obstacles – both natural and Mariana-made – without issue. We both stopped for several moments of catching our breath and wiping away pouring droplets sweat. Before we knew it we were at the chain, then back to the switchbacks, and then – amazingly – back on the trail. The whole ordeal had lasted only three hours, and realizing how quickly we came up made me regret turning around when we did. Had I had a pole for balance and more water I think I could have made it just fine. I was triumphant when we returned to the visitor center to check back in. Covered in dirt, many clean visitors looked us up and down with pity. I’m sure a few had imagined us lost for days in the wilderness, and by the looks of me, I couldn’t blame them. The ranger at the desk politely pointed us to the water faucet outside. Triumphantly filthy at the top again! It would take two more showers to get all of that pine sap off, and about a week for the knots in my thighs to dissipate. 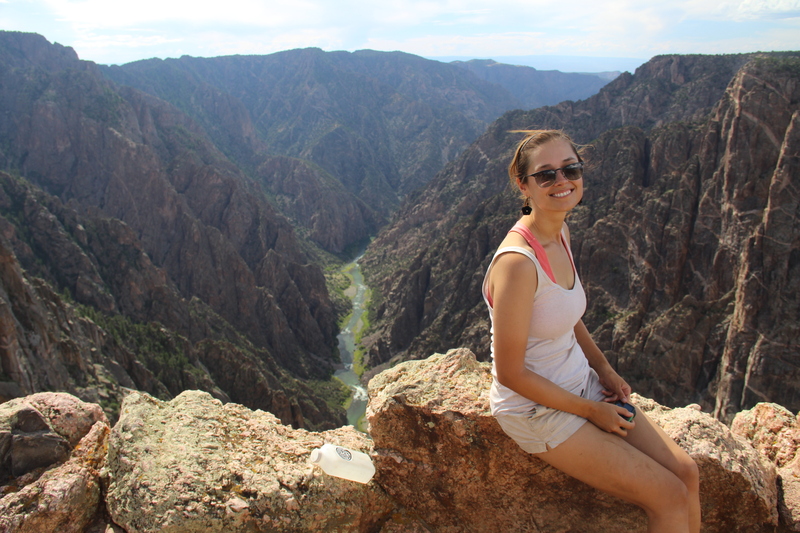 But that joyous moment of reaching the rim, of realizing we had just descended and ascended the impenetrable black canyon without major incident – albeit a few hundred feet short – that, that is something that will stay with me for a long, long time. Until I make it to the bottom that is. You and Austin are amazing! Glad you survived your adventure and thanks for sharing! I visited this park when I was in the area 2 years ago. I did not make the attempt to descend but loved the views at I think every lookout. I too thought there can’t be much here based on the surrounding area except knowing I had seen the pics on the internet when researching the park. I am glad I visited the park. And am glad Austin is great with you as he was awesome with me on our trip to the bottom of Grand Canyon Natl Park and Havasupai Indian Reservation. He’s a good hiking buddy, even if he is a little crazy. Glad you got to enjoy this beautiful place too! “I climbed the talus as ungracefully as I had come down, continuing to dislodge rocks as Austin darted like a mountain goat around the obstacles – both natural and Mariana-made – without issue.” LOL! I want to visit this and other national parks are hike trails and routes like this. I’m going to start training at the gym. Hopefully my attempt at such trails is just as successful.